The Ministry of Defence is set to sign a £3.5bn deal for nearly 600 new armoured vehicles ahead of the Nato summit in Wales. 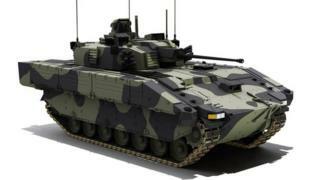 The MoD will sign the order for 589 Scout Specialist Vehicles at General Dynamics in Caerphilly county. David Cameron said the deal would aid UK security and "underpin" many jobs. At the two-day summit in Newport, due to start on Thursday, the UK will call for increased defence spending by some of Nato's 28 member states. Mr Cameron said the Scout deal would be the Army's largest single order for armoured vehicles for more than 30 years. "These new vehicles are testament to the world-class engineering skills in south Wales and across the UK, helping to create the Army's first fully digitalised armoured vehicles," he said. "Not only will they be crucial in helping to keep Britain safe, they will also underpin nearly 1,300 jobs across the UK and showcase the strength of the UK's highly skilled defence sector." Mr Cameron said the UK had the second largest-defence budget in the alliance - "meeting Nato's 2% of GDP spending target" - and was providing "leadership" within the organisation. In a speech later at the Royal United Services Institute, a defence think tank, Defence Secretary Michael Fallon is expected to call on Nato countries to increase military spending. "Not only is there a real risk of equipment obsolescence amongst Nato's European allies, but investment underpins our vital transatlantic bond," he will say. "Nato was formed on the basis that Europe would pay her way. "Like any insurance policy, defence only pays out when you pay in. "US taxpayers won't go on picking up the cheque if we choose to prioritise social welfare spending when the threats are on our doorstep." BBC defence correspondent Jonathan Beale said the comment on threats was a reference to Russian military intervention in Ukraine. The MoD said the hi-tech Scout vehicles would be the Army's "eyes and ears" on the battlefields of the future. Delivery of the first Scout vehicles is expected in 2017, with a brigade ready to deploy by the end of 2020. General Dynamics, a US-based firm, said the Scout was a "highly-agile, tracked, medium-weight armoured fighting vehicle" which would offer "state-of-the-art" protection to troops. The deal is expected to sustain 300 jobs in Wales. Kevin Connell, vice president of General Dynamics UK, who runs the Scout SV programme, told BBC Wales: "We have a really talented workforce of more than 200 and we expect down the line when we start production for that to grow even further." He said they were completing the final critical design reviews over next few months and hoped to start production in 2017, running right through to 2024. "If the MoD exercises that production option, we're looking at 10 years solid work here and probably beyond that when you consider other variants and export opportunities." Image caption Designers said the Scout vehicles were "highly agile"